View all of your account activity at a glance to get an idea of what’s been happening. Service Desk puts important information right at your fingertips. Using the different dashboards, you can instantly check the status of your incidents, problems, changes and more. Click any item to dig in for more details, or just keep an eye on the recent activity so you know how things are progressing. See what you need to see. There are many dashboards in Service Desk to help you easily find just what you’re looking for. If you want data on all your services in one place, check the global overview. If you want to see recently closed requests, check the incidents dashboard. 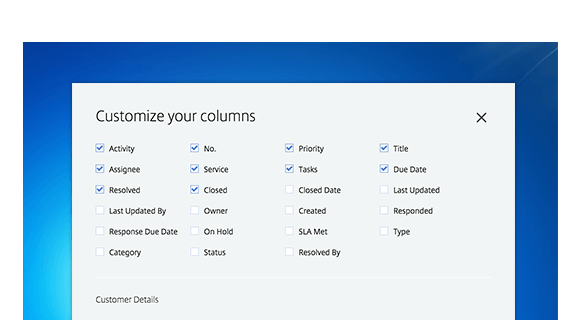 You can even change the columns to display extra categories, from custom fields to customer details. The Service Desk dashboards keep you up to date on incoming incidents, so you can react immediately when big issues appear. 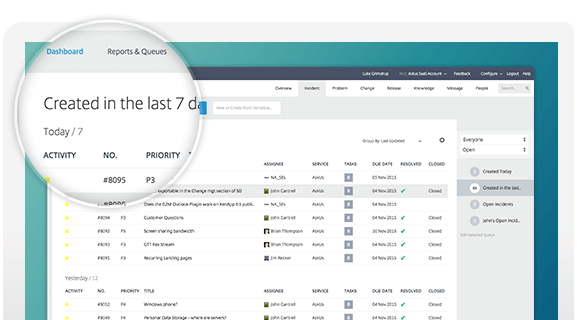 With just a look, you can spot tickets with close deadlines or high priorities in your dashboard. You know right away what needs action. Save reports on the dashboard. Have reports that you frequently check? Add them to a dashboard queue. These saved reports provide a quick count of all their open records, filtered by the report’s settings. So for example, you could easily check how many incidents were opened today or how many problems are missing workarounds.